I am proud to announce that my Valentine Cakes are now featured at Wedding Chicks. Thanks to Jen Weller owner and CEO of Ever After Bridal who asked me to participate in her whimsical romantic style shoot which took place in Stamford CT. at Abigail Kirsch at the Loading Dock. 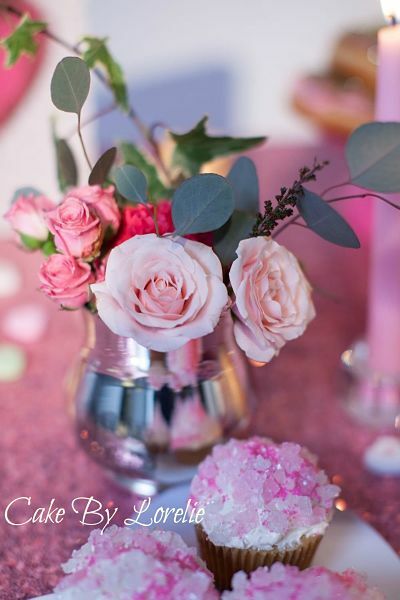 A sweet candy coated confectionary delight was desired for this very colorful Valentine's day theme photo shoot and it was beautifully photographed by Aida Krgin Photography. You can see the full blog post with the two dazzling brides and oh so handsome grooms at Wedding Chicks. 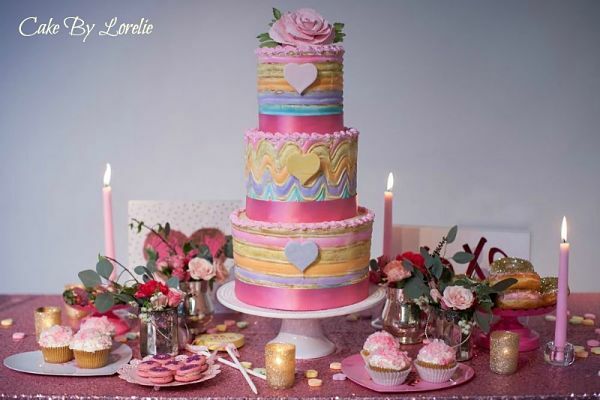 You will also see some very sweet ideas for a cake table including shimmering rock candy cupcakes, delicious glitter donuts and pink macaroons. 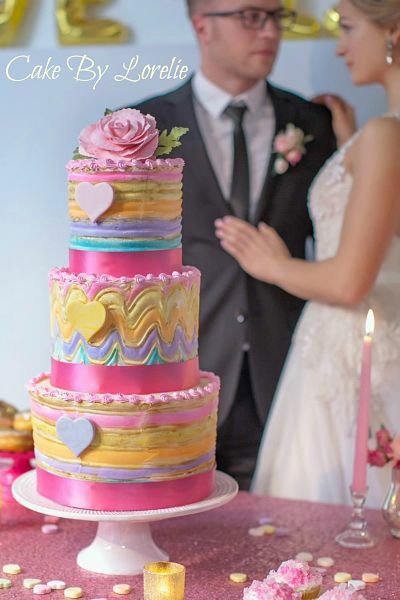 Photo credits: photo of brides with hearts, photo of valentine rainbow wedding cake, and photo of rock candy cupcakes by Aida Krgin. Brides dresses in photos by Ever After Bridal. All other photos from the cake decorators in my Facebook cake support group. Learn more about how to join the group here. 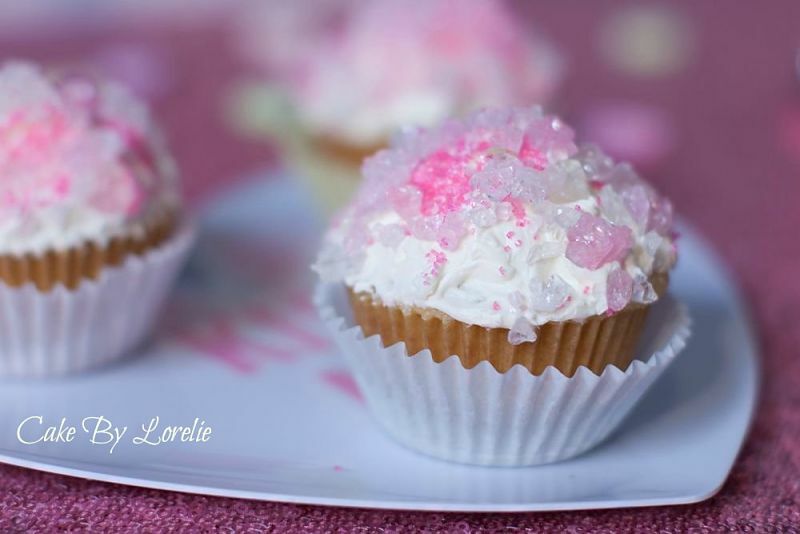 I adore these very simple and glittery rock candy valentine cupcakes. Here are a few tips if you would like to try making these. You can buy rock candy on a stick at most party or candy stores. Using a firm surface (such as a cutting board) cover the candy in a clean linen and strike with a hammer until all the pieces are removed from the stick. You can then sprinkle them over the frosted cupcake or dip the cupcake into them. I also added a bit of dark pink glitter as a contrast to the white and soft pink colors. You can see the shimmer of the gold lustre dust in between the colored stripes. The icing is the royal icing recipe, which you can find here, and is fabulous for covering dummy cakes, piping flowers and making snowflakes. After the icing dries, paint on your colors using paste food coloring that has been diluted in clear extract (or use vodka). The idea here was to make it patchy with imperfections. You can really see the detail of the cupcakes here. These were real (and I hear they were enjoyed by the crew after a very long day). "The Coconut cream Valentine cake that I made my wife was one of the best ever...taste, texture and moisture. The Pineapple custard curd was outstanding!!! Overall the cake was to die for...4 layers of coconut cake with coconut cream frosting combined with Pineapple" Thank you again, I enjoy your website and information...excellent!" 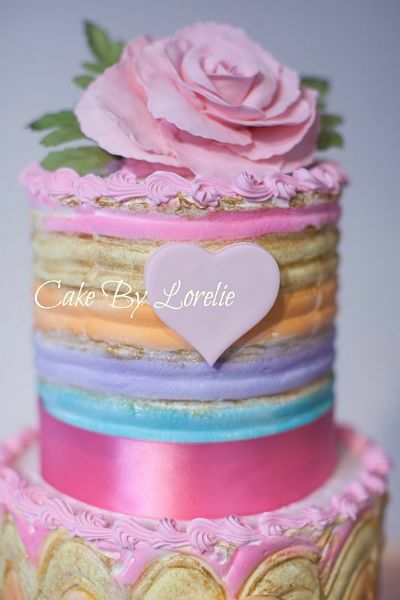 For those of you visiting who like to bake and decorate read on for a great cake and filling recipe that you can make for your loved ones for any occasion. How about some tropical delight to bring back the heat of passion? A cake full of tenderness and decorated for enchantment. I have just the recipe and decoration to fill that order and it happens to be my (and many others) favorite new cake. What sparked this recipe portion of this post today was an email from a very romantic young man (See his testimonial above) who had a question regarding the filling that is inside this medley of lush flavors. He is planning on making it for his wife for Valentine's Day. I told him she will fall even more in LOVE with him when she tastes his culinary creation.